Fatma Samoura, Secretary General of world football governing body FIFA will meet in Zurich Iranian women activists seeking the body’s support in their campaign to obtain rights to sit next to men in football stadiums. For the first female Secretary General of the organization, the meeting scheduled for Thursday “is something that is very high on the (FIFA) human rights agenda. The dialogue continues”, she is quoted as saying. The meeting will take place ahead of Saturday’s Asian Champions League final to take place in capital Tehran as local Persepoli takes on Japan’s Kashima Antlers for the second leg of the final with a 2-0 deficit. This will be the first time in 11 years that an Iranian domestic league team are playing in the final of the continental club competition. The women to meet Samoura have reportedly garnered 200,000 signatures petitioning for state’s authorization to allow women to attend male football matches. 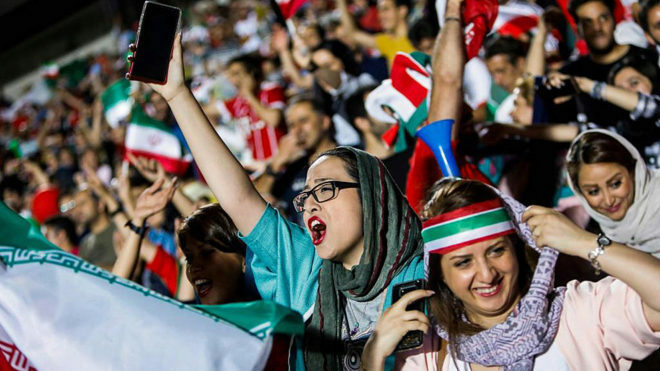 Iran is among the few countries in the world still reluctant to lift ban on women’s rights to attend men football matches. The ban has been in place since the 1979 Islamic revolution. Over authorities’ persistence, some women often disguise as men in attempts to enter stadiums. Last month, the state briefly lifted the ban allowing 300 women to sit in the stands in Tehran national stadium and watched the national team beat Bolivia in a friendly. FIFA boss, Gianni Infantino went to Iran in March to press President Hassan Rouhani for a change in the law.